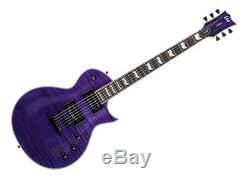 ESP EC-1000FM - See Thru Purple/Macassar Ebony - LEC1000FMSTP DEMO. It may be missing its original packaging or inserts or show very slight signs of use. 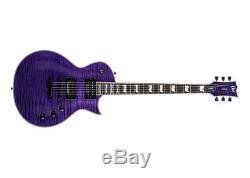 ESP EC-1000FM - See Thru Purple/Macassar Ebony - LEC1000FMSTP. Guitars in the LTD EC-1000 Series are designed to offer the tone. Looks, and quality that working professional musicians need in an instrument. Available in exciting See Thru Purple and See Thru Green over an outstanding flamed maple top with binding on the body, neck, and matching headstock, this guitar features a Macassar ebony fingerboard with 24 extra-jumbo. And high-quality Seymour Duncan pickups along with other premier components like LTD locking tuners and a Tonepros locking TOM bridge and tailpiece. It also offers set-thru construction with a mahogany body and three-piece mahogany neck. 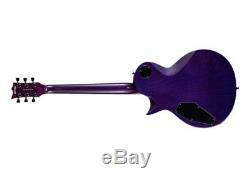 ESP EC-1000FM - See Thru Purple/Macassar Ebony - LEC1000FMSTP Features. Bridge: Tonepros Locking Tom & Tailpiece. Neck Pu: Seymour Duncan Jazz. Bridge Pu: Seymour Duncan Custom-5. Prymaxe is a family owned and operated business created by musicians, for musicians. What started out as a small vintage guitar store in New Jersey has quickly become the go-to online shop for musicians all over the world. With the largest selection of in stock effects anywhere and an ever-growing offering of the finest guitars and amps, Prymaxe is truly a one-stop shop for all of your tone needs. Whether you're a seasoned touring musician or just beginning your quest for the perfect tone we're here to help you every step of the way. When you place an order at Prymaxe, you can rest assured that your item will be carefully packaged. If you need an order immediately, please let us know and we'll try our best to accommodate your request. If an item is not received by us within the 30-day window, the package will be refused. Demo (Like New/Gently Used/Open Box) items must come back in the same condition they were sent to you, with all included materials, if applicable. Our 30-Day Satisfaction Guarantee covers brand new and demo (like new/gently used) products only -- it does not cover used and clearance products (see below). It also does not cover items in the? All Used and Vintage items come with a 48 hour approval period. Accessories this contains all pickups, strings, picks, pedalboards, tuners, etc. Clearance Items (Clearance items are clearly marked with "CLEARANCE" in the title) Special/Custom Orders. Please do not write on or attach tape or labels to the product box -- use a packing box to return the product. Please include the required return form in the box. What if I receive a defective or incorrect item? If the item was damaged due to user fault or error. When will I get my replacement item? If it does not arrive within 30 days, we will refuse the package. Why was my return refused? There are a number of reasons your package could be refused by us, including. It was a new/demo item received outside of the 30-day window. It was a clearance, accessory, or other non-returnable item. The item shows signs of wear. Products that malfunction under normal use. Used (non-demo), vintage, and clearance products. Items with clear signs of abuse (up to Prymaxe's discretion). We reserve the right to end this promotion at any time. To thoroughly show what a product can do, we demonstrate it in both a live band situation and by itself in full HD quality. These demos are an invaluable resource while searching for the perfect piece of gear that will flawlessly work with your setup. 60 Day Price Match Guarantee: No one beats a Prymaxe deal and we will never lose a sale due to price. If another authorized dealer has the product you're looking for listed for less we'll beat that price, no questions asked! After the sale you are guaranteed to have the lowest listed price on the internet for 60 days. International Customer Care: We love and truly appreciate all of our International customers. Also, we are here to assist you with any special requests you may have and offer special bulk pricing for larger orders. 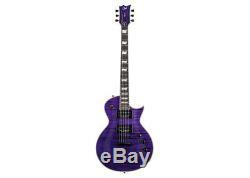 The item "ESP EC-1000FM See Thru Purple/Macassar Ebony LEC1000FMSTP DEMO" is in sale since Friday, July 13, 2018. This item is in the category "Musical Instruments & Gear\Guitars & Basses\Electric Guitars".